For Toyota, The Toyota IMMO Key maker has a data base of all the Toyota keys (except the Smart key); It may copy the 13. 4C and all the 4D transponders; The Database of the keys are in the IMMO key maker so even if you don¡¯t have the original key you can generate the data from the built in Data base; It automatically analyzes and counts and checks data, and it hardly take 20 seconds to copy several Keys. For Mazada 6, it may do the Madaza keys automatically. May reset the original key label. This adapter can be used to read the pin code of the transponder key automatically, and write the pin code into the computer transponder of the suited ECU. It can be used to match the vehicle without keys and needn’t change any computer when matching.Be suitable for all the Toyota Series from 1997 to 2005. Be suitable for the wafer key’s match of Toyota, such as LEXUS (LS400 ES300 GS300 IS2000 IS300)、Camry 2.0、2.4、JEEP-2007 3400 4500 4700、AVALON、PREVIA. Dismantle the engine ECU from the vehicle (or IMMO), and take down the IC chip identified as “93C56”(fixed to the computer in the vehicle engine; for the Camry being IC601, and Lexus being IC900. Identification number for a chip fixed to IMMO is 93LC66). Clean up every pin of IC to make sure of a sound connection. 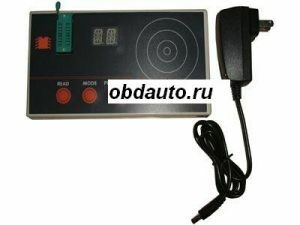 Supply electricity to the programmer, the screen will show” can work normal” with a beep sound indicating that the machine is working well. •Press “R-key”, and the red light “LED” will be lit; programmer is thus ready for programming. •Put the key on the key logo of the programmer. •Press R-key again to hear the beep sound beep 4 times, and the red light also goes off, these means that the key has been successfully programming to the programmer. If the beep sound is not made 4 times, then repeat the operation until you hear the exact 4 beep sound. •By the stated operations you can programming 3 keys to the programmer altogether. •Now you can verify whether the 3 keys have been actually programmed: press R-key, put a key near the key logo, if a 4-beep sound is made, that means the programming is effective. Every key must be verified so that they can be program to 93LC56 and 93LC66. •Press Pr-A, Pr-B and Pr-C orderly to programming the 3 programmed keys to 93C56(or 93LC66). When “OK” displays, the programming succeeds; otherwise “ERROR” signal appears. Failure may be due to misconnection between 93C56 and the programmer, or the reverse installation or corruption of the chip. In this case you better repeat the adaptation twice to ensure the success. •Now that IC-93C56 (or 93LC66) has three keys programed to it, you can now weld it to the engine ECU. Make sure the weld is good. •Fit the ECU back to the vehicle. With any of the previously programmed keys you can start the vehicle now.